I took a decent number of photos during my trip to Sydney last summer (winter down under). Yet, all I posted was that Sydney sunset. Almost a year later, here is a random selection of images. And by random, I mean the ones I feel like posting right now. I'll start with a couple of shots from the campus of the University of New South Wales. My cousin lives nearby and I decided to walk through UNSW on the way to the bus stop. The intermittent rain worked out great photographically. The next pair were taken outside my other cousin's home in Cecil Hills. I used my 3-stop neutral density filter to get the cloud blur effect. Beau loves playing frisbee catch. I suppose no set of Sydney photos is complete without the Harbour Bridge. I snapped this while on the ferry from Circular Quay to Manly. This guy hitched a ride, so to speak, on the ferry's wake. He was a popular sight. I grabbed this long (multiple) exposure as I walked from Mrs Macquarie's Chair to the Town Hall area to meet up with friends for dinner and drinks. If I remember correctly, this is the Cahill Expressway. This image, also taken along the walk to Town Hall, is Hyde Park in front of St Mary's Cathedral. 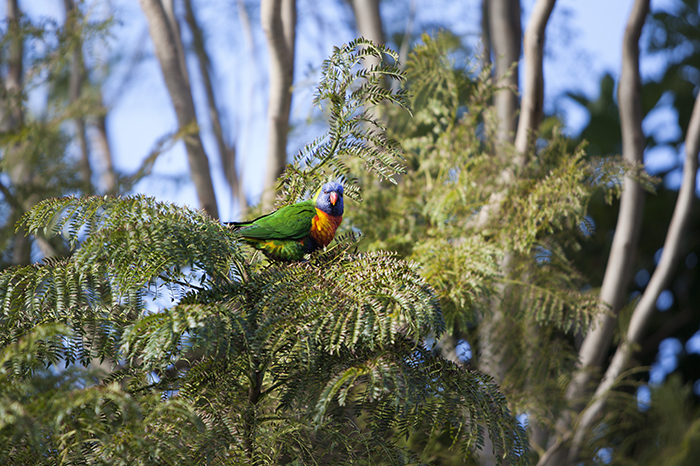 Finally, I took this photo of a Rainbow Lorikeet in my cousin's backyard as I was killing time ahead of my flight back to the US.